Criminal justice schools in Maryland can provide a variety of degrees, certificates and professional training to pave the way to careers across law enforcement, corrections, law and legal support and the justice system. With large cities like Baltimore ranked highly on the FBI's Uniform Crime Report, the need for qualified criminal justice professionals is ever present in Maryland. For prospective students, finding the right criminal justice school means choosing a particular area of study in the industry. Use the following guide to explore criminal justice schools in Maryland, compare the best programs and degree options and learn about the employment outlook for different careers in legal and protective services in the state. After Criminal Justice School in Maryland: What's Next? Criminal justice is a popular academic field of study that can be found at nearly every institution of higher education. Community colleges, technical training centers and public, four-year universities may all offer forms of criminal justice degree program, but which criminal justice schools in Maryland are the best? 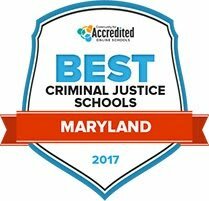 This list ranks the top programs using a culmination of many factors and criteria, including tuition and graduations rates, to give students a better picture of Maryland's best criminal justice schools. Students who want to transfer to a bachelor's program at a four-year university can pursue an associate in arts degree at Prince George's Community College. That associate in applied science degree program, on the other hand, is designed for those who plan to enter the workforce immediately after they graduate, although most of the AAS can also transfer to four-year school. Whichever track they choose, students will receive academic advisement, career services and counseling services. They will also have access to transfers guidance, mentoring opportunities, tutoring, assessment testing, disability services and health education. Criminal justice students can earn an associate of applied science degree in either law enforcement or corrections at Cecil College. Graduates should qualify for work at correctional facilities, with private security firms or in numerous fields of law enforcement. Students who choose to pursue a full degree can transfer to a four-year university. The college offers academic and transfer advising, child care, library services, a math lab, a reading and writing lab, and a fitness and wellness center. Students can seek job search assistance from the career services center, and the library provides a number of academic resources. An associate of arts degree in criminal justice from Chesapeake College prepares students for entry into dozens of professions related to law enforcement, both civilian and uniformed. The degree is offered in two tracks: crime scene technician and law enforcement. Through the Learning Resource Center, the college offers TRiO student support services, which are designed to help students through individualized tutoring, academic advising, transfer and career planning, study skills and time management. The overwhelming majority of students who utilize TRiO maintain good academic standing and either graduate or transfer successfully. There are also several clubs and organizations for students to join or use for networking. Students interested in criminal justice have several options at Wor-Wic Community College, including an associate degree, certificates and letters of recognition. There are three separate tracks: law enforcement, corrections and forensic science. The school maintains many departments designed to support students' academic success. The Student Engagement department deals with student clubs, student government and the fitness center. There are also departments dedicated to registration and advising, counseling and child development. Career services include job fairs and other similar events, career exploration, employment planning and help with resumes and cover letters. A range of other services are available through the TRiO program. Anne Arundel Community College offers an associate of applied science degree in criminal justice, which is designed for students seeking employment right after graduation. There is also a letter of recognition for students who complete fewer than a dozen credits toward a specific skill or concept. Finally, certificates are offered to students who achieve a specific credential. Student services include career resources, tutoring and testing help, and assistance with math, reading and writing. There are also several computer labs and library services. All students will meet with an academic advisor, and counseling services are available to students in need. A criminal justice degree from Coppin State University in Baltimore, Maryland, will help prepare students for law school, graduate school or a career in the justice system. The university offers both undergraduate and graduate degree programs in criminal science. Graduates should be eligible for careers in correctional counseling, court administration, law enforcement and private security. For students that specialize in statistics and computer science, criminal justice agencies may have jobs available for planners, researchers and data analysts. Scholarships, grants and financial aid may be available to qualifying criminal justice program students. The University of Baltimore (UB) is only the second institution to have its graduate and undergraduate criminal justice programs certified by the Academy of Criminal Justice Sciences. Students pursuing an undergraduate degree at UB will have exposure to the fundamentals in the criminal justice field, along with the opportunity to customize their studies based on personal interest. In addition, students can apply hands-on learning through an internship at a local agency. Career options include positions in law enforcement (federal, state and local levels, corrections, juvenile justice, and investigative services. Qualifying students can also apply credits to a master's degree in criminal justice. Students interested in attending the University of Maryland University College can obtain a bachelor's degree in criminal justice. The program is available completely online, or can be offered in a hybrid format which combines traditional face-to-face learning with an online environment. Students will learn the theory and practical aspects of the justice system, including criminal behavior, law enforcement, courts, corrections, security and investigation. On campus clubs and organizations also include the Criminal Justice and Investigative Forensics Club and Pi Gamma Mu. Financial aid options are available to students who qualify. The school of humanities and social sciences at Stevenson University offer a bachelor's degree in criminal justice (a minor is also available). Experiential learning is one of the requirements at Stevenson so students can gain real-world application of the core fundamentals. Common career options include legal system/courtroom, law enforcement, investigation, corrections, security and social services. Students can become active members of the Criminal Justice Students Association and can consider the Criminal Justice Study Abroad Program where they can gain global awareness. There is also the BS to MS option, which applies some coursework toward a master's degree in one of the graduate programs offered at Stevenson. The University of Maryland Eastern Shore offers both an undergraduate degree in criminal justice and a graduate program. The Bachelor of Science degree in criminal justice is a four-year course of study that combines history, sociology, political science, psychology, social work, and law. During students' junior and senior years, they will be exposed to field experiences, seminars and laboratory work to apply real-world experience. The three areas of concentration for this program are corrections, law enforcement and pre-law. Students may also elect to become members of Alpha Phi Sigma, the National Criminal Justice Honor Society. When prospective students are considering their educational options, tuition is usually at the top of their list. However, there are other factors, such as school enrollment, acceptance rate and degree concentrations that should be considered before making a decision. Search through the criminal justice school options in Maryland using the tool below to review different programs and compare individual areas of study. Students interested in attending criminal justice school in Maryland are probably also interested in learning which criminal justice jobs are popular in the state. Because of its sheer diversity as a profession, it can be difficult to pin down the best educational path in a field like criminal justice. Whether a public service job (e.g. police officer) or administrative role (e.g. court clerk), the field of criminal justice offers varying types of roles to suit many personalities. Highlighted below are a few of the top jobs in criminal justice in Maryland, with information their employment outlook and educational requirements specific to the state to help students get started. As noted above, Maryland has a robust criminal justice system with employment opportunities at the local, municipal, county and state level at government organizations or with non-profits and private businesses. Students interested in attending criminal justice school in Maryland can get a better picture of the overall state of the industry by looking at the graphs below, showing which criminal justice occupations pay more or have higher growth projections than the national average in Maryland. Scroll over each bar to see the numbers, and what type of degree each job requires in the state. For criminal justice students in Maryland, deciding where to go after graduation can be as challenging as deciding where and what to study. The career options are diverse across Maryland-from large metropolitan areas like Baltimore to smaller communities like Cumberland. The map below helps students at criminal justice schools in Maryland understand more about the demographics of the industry across different areas of the state. Scroll over the markers to learn about the differences in wages and employment numbers for these top. A professional group for in-house business law counsel professionals in the Baltimore area, providing social, networking and educational events. A state agency that promotes business development in Maryland, including resources into statewide compliance rules, regulations and procedures. An office of the Maryland Department of Commerce that helps small business owners and entrepreneurs navigate local, state and federal government processes and regulations. An association of correctional professionals that offers membership and advocates for public policy and legislative changes that support the field of corrections, awards scholarships to students and offers professional development opportunities. The prison industrial arm of the Maryland Department of Corrections that trains and employs offenders in state prisons and conducts community outreach programs. The state department that manages 27 correctional institutions in the Maryland and 45 parole and probation offices, has 12,000 employees and operates a variety of programs to protect public safety. Founded in 1997, a nonprofit organization that supports Maryland's Court Appointed Special Advocate programs to find placements for neglected and abused children in Maryland. The official association for court reporters in the state that offers networking events, hosts conventions and supports professional development activities in the field. Founded in 1001, the Maryland Teen Court Association offers programs to reduce juvenile crime and develop new teen court programs in the state. A membership-based organization for attorneys and associated legal professionals that promotes judicial study and serve as a forum for professional concerns in the field. A membership organization that represents more than 25,000 judges and lawyers in Maryland and offers career support, legal resources and professional networking opportunities. A specialty association that supports equal rights and professional development for women in the legal profession. Founded in 1961, the association has membership across public and private law enforcement agencies that holds an annual seminar and provides professional development programs. An organization with more than 20,000 active and retired law enforcement officials that has local lodges and advocates on behalf of its members. A professional, non-profit organization of 600 members across 84 different criminal justice agencies throughout the state of Maryland. A non-profit organization founded in 1985 that operates a series of environmental training programs, conferences and networking events. The state department for managing environmental, conservation, rehabilitation and public health projects throughout Maryland. Found in 1990, the association is a non-profit organization that has members among local, state, federal, industry and commercial environmental industries. The enforcement arm of the Department of Natural Resources, these officers cover everything from boating laws to homeland security, search and rescue and emergency medical services.